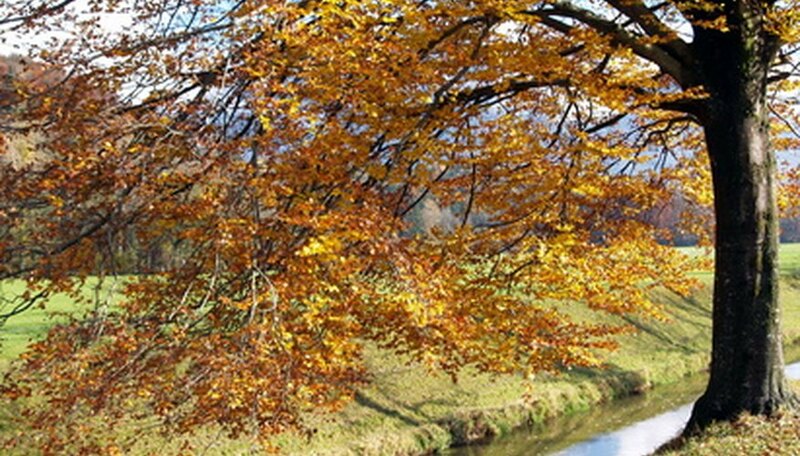 Elm trees feature 30 to 40 varieties of deciduous and semi-deciduous trees, some of which grow up to 100 feet tall and provide excellent shade underneath. Sometimes killing elms becomes necessary because the deeply embedded roots of these invasive trees compete with surrounding vegetation for nutrients and moisture and weaken foundations of homes. Several methods of effectively killing elm trees exist. Manual removal by cutting or chopping is the most effective way of killing an unwanted elm tree. Make sure the tree is relatively small in size, as chopping large trees down poses a security hazard to nearby property or power lines. Inform the local authorities about your intention so you receive a permit beforehand. Different jurisdictions have different laws regarding cutting down of trees, so make sure you arrange a meeting with the local authorities, such as a township environmental officer, and discuss permit conditions, fees and all detail beforehand. Determine where the elm will fall. Use an axe to cut outward branches off, reducing its size. Make a downward cut into 1/3 of the trunk at a 45-degree angle. Make a second horizontal cut that meets the first cut and forms a wedge. Remove the wedge to pivot the tree. Make another horizontal cut on the other side of the tree that is higher than the wedge. The elm falls as this cut reaches the appropriate trunk depth. Remove as much of the stump with a saw, and dig around it with a shovel to sever the roots. This releases the remaining stump so you can pull it out of the soil easily. Certain chemicals, such as herbicides, kill unwanted elm trees. Carve away sections of the elm tree trunks bark with a hatchet or axe to provide a pathway for the herbicide to reach the vascular tissue. Do this all around the trunk's circumference. Immediately apply systemic herbicide to the exposed areas. Use a pump sprayer, pour directly from the bottle or soak a sponge in the herbicide and squeeze it over the exposed sections. Avoid applying herbicide in spring, however, as sap flowing from the wound prevents good herbicide absorption. This process requires multiple applications to kill the unwanted elm tree. Once dead, chop it down with an axe to remove it from the site. Girdling is an effective method of killing an unwanted elm tree, though it takes up to 2 years to be effective. It prevents the tree from transporting essential nutrients from the roots to the leaves, thus causing it to die. Strip the bark around the tree trunk completely with a handsaw as it speeds up the process. Do not make deep cuts that penetrate the tissue; only remove the outer bark. Cutting a tree too deeply enables it to re-sprout and grow even thicker. Inspect the girdled elm frequently and strip any bark that grows back.